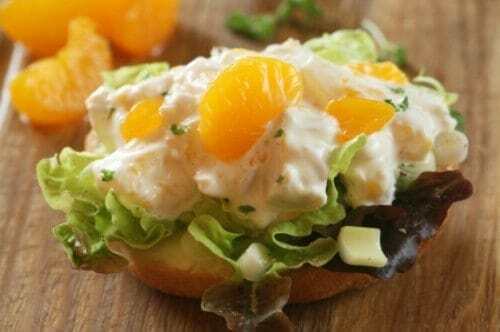 Home » CopyKat Recipes » No Guilt Chinese Chicken Salad – this salad is light, healthy, and full of flavor. My wife and I love Wendy’s Mandarin Salad. She is diabetic so I had to come up with something she could eat. This tastes as good as original without all the sugar. It’s great. Thanks to Columbamio for sharing this healthy salad recipe. This chicken salad is packed with fruit and more. Prepare the dressing by combining all dressing ingredients except vegetable oil and sesame seeds. Blend on high speed. While blending, SLOWLY add oil to the mixture to create an emulsion. After completing emulsion, Add sesame seeds and blend for just a couple of seconds. Pour dressing into a covered container and chill. Cut chicken in to bite size pieces. 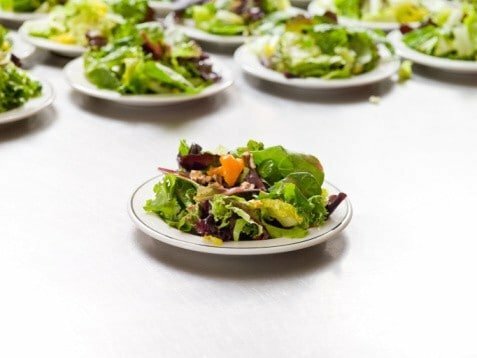 Build each salad by first arranging about 4 cups of iceberg lettuce in the bottom of a large salad bowl or plate. Sprinkle bite-size pieces of chicken over the salad. Arrange about 4 mandarin orange wedges on each salad. (you can eliminate to reduce more sugar content). Add sesame dressing to each salad. Sprinkle about 1/4 cup dried chow mein noodles and 1/4 cup roasted sliced almonds on top of each salad and serve. carbs for a Diabetic. I really dont feel this is a light salad, at all. My apologies if I am wrong. Pam, these stats are always relative to our personal needs. I am sorry this recipe wasn’t ideal for you. This was a hit with all of the kids today! Where does the peanut butter come into play? It is listed below the 2 ingredients that are withheld until the finishing touches of the dressing. Is it supposed to be part of the initial dressing ingredients or part of the chicken and below ingredients? I love Wendy’s Mandarin orange Salad! This looks so good! I’m also diabetic to this will be good for me as well! Thanks for sharing this.